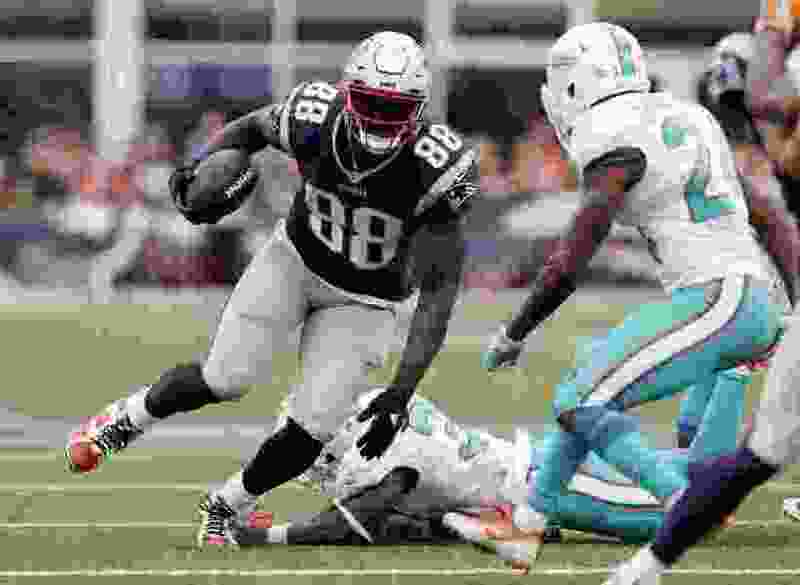 Martellus Bennett: We teach black boys sports are their only hope. What if we let them dream bigger? As young black boys in Alief, Texas, my friends and I often spent afternoons imagining ourselves scoring the game-winning touchdown at the end of the Super Bowl. Each time we went through it, the final play would become more outlandish. Blue 42! Blue 42! Check Check Check! Omaha! Omaha! Set! Hut! The quarterback would take the snap, drop back and throw a short pass to the wide receiver or, in my case, the tight end. (I always loved short passes more than Hail Marys, because you could really show off your skills as a runner.) We'd juke three linebackers, break 20 tackles, stiff-arm the strong safety to the ground and hurdle the referee before tiptoeing down the sideline and front-flipping into the end zone. The crowd would erupt: "TOUUCCHHHDDOOWNNNN!" Confetti would fall. The commentators would be stunned. We'd dogpile each other, screaming and rejoicing. And we'd follow it with a postgame news conference. "I've prepared for this moment since I was a little kid," we'd say. "I always knew I would make it here." As we spoke, we'd take sips of Gatorade, because when we made it big, that company would surely be one of our sponsors. It felt great. Beyond great, actually: It felt real. We knew we could be champions because the ones we watched on TV looked just like us. And we had already learned that to escape to a better life, we needed to be wearing a jersey. The jersey became a cape; our talents on the field became the superpowers we were recognized for. We were black boys. And to be born a black boy is to be born into athletics. Black fathers are often disappointed if their sons aren’t good at sports. Not excelling at sports as a black boy meant not being cool — even weirder, it meant not really being black. When you’re growing up as a black boy, it feels like the world tosses you a ball and says, Good luck. Go get 'em, Champ. The superpowers we felt wearing a jersey were real: We could leap defenders in a single bound to catch the ball, run faster than a speeding bullet down the sideline, lift 400-pound offensive tackles with our super-strength. Passed down generation to generation, from black boy to black boy, those jerseys empowered us. We all believed we were the chosen ones who could do the impossible, what we saw so many before us fail to do: make it to the National Football League. Eventually, I did. But most of the black boys I spent my afternoons with, playing in imaginary Super Bowls, weren't at the lockers next to mine. Most of the black boys who picture themselves winning this Sunday's game will never play in a real one. And that’s fine: Playing in the NFL isn’t really — and shouldn’t have to be — every black boy’s dream. But black boys don’t always know that their dreams off the field matter. They need the space to see other, diverse possibilities for themselves. Black boys shouldn’t have to feel that being good at sports is the only way to be cool — or to be valued by the world. A jersey isn't the only cape a black boy can wear. The stats prove I was the exception: Less than 2 percent of college football or basketball players go on to play in the NFL or the National Basketball Association. Just 8 out of every 10,000 high school football players get drafted by an NFL team. But for too many black boys, that's still the only path to success that seems feasible. At the 65 universities in the biggest NCAA sports conferences, black men are 2.4 percent of undergraduate students but 55 percent of the football players and 56 percent of the basketball players. Growing up, our athletic talents created a hierarchy for how we were viewed in the neighborhood. Colleges, newspapers, magazines and websites even ranked us according to ability. The better you were at sports, the more respect and love you got. We were celebrated as athletes, and that felt good — every kid wants to be celebrated — so we all competed to become the best. Parents saw our potential and pushed us to keep trying. If you were an average player, they’d take time to set up practice drills to help you improve. If you were good, the entire community invested in you — coming to games, talking about you in the barbershop. Even your friends saw you differently: There was hope for you, but not for them. The neighborhood held you to a higher standard than the other kids. You became the chosen one. You’re the one who’s gonna make it. If you were average at school, though, almost no one pushed you to become a better student. No one set up drills to take your academics from good to great. Grades mattered only when they kept you from playing. A C-minus and an A-plus were exactly the same, because they both meant you were eligible to stay on the team. In college, too, you’re an athlete first, a student second. Coaches steer you into majors at which they think you can succeed — defining “success” as maintaining eligibility — and toward courses that don’t pull you away from your athletic responsibilities. As black boys, you go to college to try to get to the league, not to try to get a degree. So as black boys, we learn to dunk on people in the paint, not paint beautiful pictures. We stiff-arm defenders, not defend people in court. We crossover our opponents, we don't cross over into business. We learn code names for play calls, not how to code. We touch the top of the backboard, not the stars. We get introduced to the world based on our athletic attributes. Our superpowers. "That's the boy with the killer crossover." "That's Michael's son. He has an even better jumper than his dad." Or, if you were me: "This is Martellus. He's the 6'6" small forward at Alief Taylor High School. Boy gets buckets." Our dreams on the field or the court seemed to be the most important ones to those around us. So they became the most important dreams to us, as well. They were the only dreams that those around us made us believe in. And in Alief, where I grew up — and in places where so many black boys like me grow up — we had to believe in something. In my neighborhood, more than one-third of adult residents don’t have high school diplomas; less than 20 percent of black men in the Houston area have college degrees. Nationwide, black students get expelled from school three times as often as white students. Half of all black men have been arrested at least once by age 23. No wonder dreaming up a way out feels so urgent. Football coaches at any level — high school, college, the pros — don’t like players to have interests outside of football. You can’t really love football if you love other things, they tell us; the marriage of player and sport is meant to be monogamous. A guy who plays football and also makes art? The football gods would never allow it. Once the world labels you an athlete, people don’t believe you can do anything else. And when you try to share your other gifts with the world, you’re constantly reminded that no one cares. It shouldn't be that way. Every dream matters. Every dream deserves support. Every dream counts. And they're all worth way more than a layup or a touchdown. As black boys, my friends and I never dreamed about creating the next tech giant, or running a Fortune 500 company, or opening restaurants, or winning Oscars for directing movies, or becoming real estate tycoons, or being elected president and changing the world. No one ever told us about all of the other possibilities the world offered. No one ever made us feel that we could achieve anything and everything we dreamed of. The NFL is nearly 70 percent black, so we knew we belonged there. But the tech industry is less than 8 percent black, so we didn't really feel like that was for us. Only 6 percent of doctors are black. Only 2 percent of teachers are black men. There are only three black CEOs in the Fortune 500. Black directors made only 5 percent of Hollywood's biggest movies in the past decade. Those worlds look mostly white, because they are. There just aren't that many heroes who look like we do outside of sports. We shouldn't have to imagine being "the black Walt Disney" or "the black Steven Spielberg" to think about going into movies, "the black Steve Jobs" or "the black Bill Gates" to dream of being high-tech innovators, or "the black Stan Lee" to picture ourselves as comic book writers. We can begin to change that — not just by integrating those mostly white realms but also by allowing black boys the space to dream differently. Accept them for who they show you that they really are. When you look at black boys, see them as the future writers, composers, chefs, tech moguls, presidents, film directors, architects, illustrators or fashion designers that they are. The world is more beautiful when we let black boys dream big. I want all the boys like my childhood friends to know that they are more than athletes, more than a jersey number, more than their 40-yard-dash time — that in the biggest game they’ll ever play, they won’t be able to dribble their way to victory, and that there are people rooting for them off the courts and fields as future leaders. The traits that make these strong, beautiful black boys great at sports — mental toughness, dedication, passion, determination and willpower — will propel them forward in other areas. With the right preparation and the power of imagination, every black boy can win. Every dream is achievable for black boys. I write this not as a former basketball player who entered the NBA draft in high school or as a Super Bowl champion, but as a children's book author, a film director, a writer, a comic book enthusiast and creator, a painter, an illustrator, a creative director, an entrepreneur, an investor, a candy-maker, a shoe designer, an executive producer, a musician, an app developer, a political cartoonist, an activist, a toymaker, a husband, a father, a business owner, and a property owner. I write this as a black boy who's still dreaming new dreams.